This will restore the cosmic balance, yes? Writing this post after all that filth in the post below. When Rosa Parks refused to give up her seat to a white man forty years ago on December 1, 1955, she was tired and weary from a long day of work. At least that's how the event has been retold countless times and recorded in our history books. But, there's a misconception here that does not do justice to the woman whose act of courage began turning the wheels of the civil rights movement on that fateful day. Rosa Parks was physically tired, but no more than you or I after a long day's work. In fact, under other circumstances, she would have probably given up her seat willingly to a child or elderly person. But this time Parks was tired of the treatment she and other African Americans received every day of their lives, what with the racism, segregation, and Jim Crow laws of the time. "Our mistreatment was just not right, and I was tired of it," writes Parks in her recent book, Quiet Strength, (ZondervanPublishingHouse, 1994). "I kept thinking about my mother and my grandparents, and how strong they were. I knew there was a possibility of being mistreated, but an opportunity was being given to me to do what I had asked of others." The rest of Parks' story is American history...her arrest and trial, a 381-day Montgomery bus boycott, and, finally, the Supreme Court's ruling in November 1956 that segregation on transportation is unconstitutional. But Parks' personal history has been lost in the retelling. Prior to her arrest, Mrs. Parks had a firm and quiet strength to change things that were unjust. She served as secretary of the NAACP and later Adviser to the NAACP Youth Council, and tried to register to vote on several occasions when it was still nearly impossible to do so. She had run-ins with bus drivers and was evicted from buses. Parks recalls the humiliation: "I didn't want to pay my fare and then go around the back door, because many times, even if you did that, you might not get on the bus at all. They'd probably shut the door, drive off, and leave you standing there." She wouldn't give up her seat on a bus and at the end of it all our world was cleaner and something we can be prouder of. I learnt about Rosa Parks four years ago, and I only got two line of information but she's stayed in my mind ever since. It's always remninded me of what one person can do if they wanted. In Britain we're nearing the end of our Black history month. It's not really something to shout about, its all very low key and very lame and all they talk about is slavery and civil rights and theres not even been a proper news piece about Rosa Parks! All the black people learn, when it's put down to the news teams and schools all they do is give the impression black people hadn't achieved anything much. It's been 50 years since the civil rights movement shot off. I kinda hope the next 50 years will fare better. don't know if you remember me, but i was looking over old posts and comments on my site and i saw your name. I didn't know that Rosa Parks had died. RIP Ms Parks. She was an amazing person, quietly leading by example. It is also somewhat interesting to note that the case got to the Supreme Court so quickly. It often takes several years. She was an articulate, intelligent and strong woman, who beautifully illustrated the power of WORD to change the world. Backed up with peaceful action. 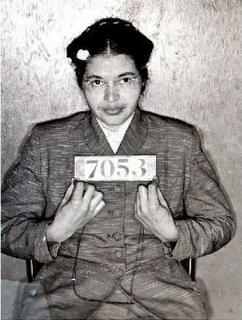 Thank you Rosa Parks, you made the world a better place. She was always one of my heros. Another woman that impressed me was Harriet Tubman as well. You're right. This definitely makes me feel better about the world, knowing that there are women like her in it (or out of it as the case may be). I saw the headline about Ms. Parks on Monday and I took a moment to remember her in silence. As a child, we were taught in school every February about the Civil Rights Movement and the deeds of Ms. Parks were always brought up. She is a hero whose story and actions will endure the test of time. Our world was very lucky to have her in it. She was quite a woman. RIP, Big Momma.